If you do not complete this form before the end of business on the date it is due, late fees will be charged. ​Late fees are $25 the first day it is late and $10 each day thereafter. You MUST turn in a Visa application, along with your passport, a $100 money order, and a passport photo that meets the requirements of the passport office, to Awe Star NO LATER THAN April 1, 2019. You cannot get into the country without a visa! 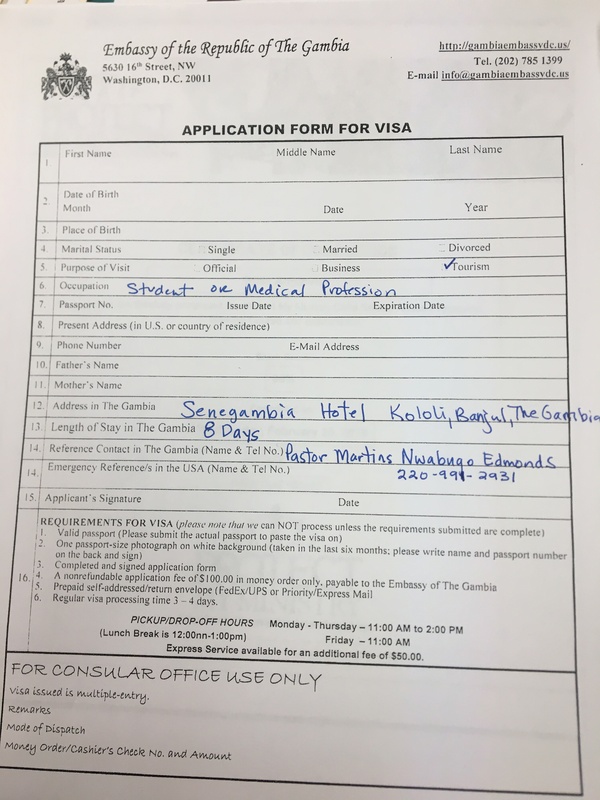 Sample Visa: YOU WILL NEED THIS TO COMPLETE YOUR VISA APPLICATION! You are responsible for your own travel to and from Dallas, TX for Awe Star University. You will need to email a copy of your flight itinerary to Martha@AweStar.org as soon as it is booked. Missionaries should be picked up the morning of Sat. June 30 at Dallas Christian College in Dallas, Texas! When packing for The Gambia, we strongly suggest that you purchase a LifeStraw Go water bottle or a LifeStraw Universal, which is a converter that works with your Nalgene!